Innovetica is a strategic trading card game developed in Switzerland and involves innovative and creative thinking. It can be played in real life with up to three friends or virtually via an app. The app is completely free to download. What does Innovetica stand for? Innovetica is a portmanteau of the words ‘innovation‘ and ‘Helvetica’, which means ‘Swiss‘. Innovetica, therefore, stands for innovation made in Switzerland. The list of all the people who have contributed to Innovetica can be found here. The collectible Innovetica cards (physical 4.5 x 4.5 cm) are available at special occasions like our Innovetica Masters booths at events, exhibitions and tournaments. Through scanning the QR-code on flow packs, you can unlock digital cards in the Innovetica game app. In the game app, the more you play, the more digital cards you earn. You can also collect additional digital cards using the QR code scanner. Flow packs are small printed FSC-paper packs (recyclable) containing two cards each. Cards are distributed at random. Each flow pack also contains a code that you can use to get new cards in the app. No, the whole app is available for free and there is no additional paid content in the game. Do I need to know anything about trading card games to play Innovetica? No, you do not have to be familiar with any other trading card games or have played them to understand Innovetica. How do you play Innovetica? The rules of Innovetica are explained here. Which platforms can I use to play Innovetica? Innovetica can be played using the physical cards on a table with friends or on smartphones and tablets using iOS or Android systems. On iOS, the app runs on Version 8.0 and later; on Android, you need to be running at least version 4.1 to play Innovetica. How do I get Innovetica for my iPad® or iOS smartphone? You can download Innovetica from the iTunes® App Store. How do I get Innovetica for my Android™ tablet or smartphone? You can download Innovetica in the Google Play Store. Does the app have a chat feature? No. Innovetica does not have a chat feature. To express your feelings during matches, you can send Innoji (Innovetica-themed emoji) to the opponent player. Do I need an Innovetica account? Yes, you need a free account to play Innovetica. All you need is a player name, a valid email address, and a password. Is the card collection on my mobile phone the same as on a different device or tablet? Yes, if you log into your account from a different device, you will find your entire card collection there. Yes, you need to be connected to the Internet to play Innovetica. Please note that using the app may incur additional charges with your mobile service provider if you are not logged into a wifi network. Someone in my family would like to set up their own Innovetica account. Is that OK? If someone else would like to play Innovetica on your device, you can log out of your account and log in with a different account or create a new one. Please note that your collection is linked to your account and not to your device. How can I improve the game’s performance? On certain Android devices, disabling power saving mode may improve performance. Please see your device instructions for more details. Anyone who has installed the app can play the game. Only people at least 17 years of age and who live in Switzerland or the Principality of Liechtenstein can participate in the Weekly Challenges competitions. Please see our General Terms and Conditions for more information. We want to run the game for decades. The game was launched in November 2017. There are great new prizes to be won each week. You can view the latest and upcoming prizes under Prizes. The current version of Innovetica is available free of charge thanks to the sponsors listed on this page. Sponsors also donate prizes for the Weekly Challenges. Innovetica is available in German, French, Italian, and English. If you are unable to log in, select the appropriate option on the start screen. We will then send you an email containing a link to reset your password. My account has been locked by mistake! If you believe your account has been locked by mistake, please contact us and send us a brief description of your problem. Help! I’ve received a code or redeem link in WhatsApp or via email and it does open the browser, but not the Innovetica app! 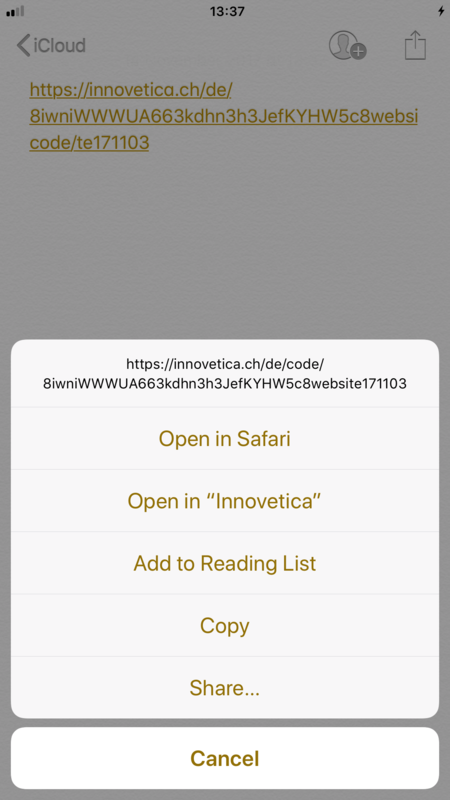 When you click on an Innovetica code or redeem link on your mobile, the Innovetica app should be opened automatically. Copy the code or redeem link in WhatsApp or in your email with the regular “copy” function . Open the Notes app and paste the code or redeem link in a new note. Long-press the code or redeem link until you see the context menu below. The link is properly opened and unlocked in Innovetica. From now on the automatic link is reactivated in all other apps as well. If that does not help, try to reinstall the Innovetica app again. In which country is the data stored and processed? Yeah. If you would like to request a deletion of your account, you can do so at support@innovetica.ch If you wish to remove from the marketing materials, you can do so by unsubscribing from the newsletter. If you want to remove your data from the Weekly Challenges, please contact the sponsor. iPad is a registered trademark of Apple Inc. Android is a registered trademark of Google Inc. All other trademarks mentioned here are the property of their owners.